Ion nitriding is an efficient chemical heat treatment method to increase surface hardness of metals by taking them to a specific temperature and subsequently introducing atomic nitrogen. The nitrogen is then absorbed and diffuses into the material, compounding with iron (Fe4N, very hard) or other alloying elements. Thanks to our high-technology facilities, at TAG we can perform ion plasma nitriding which creates on the surface of components a layer of nitrides whose essential properties, such as depth, hardness and composition, can undergo further testing in order to ensure the treatment has been successfully performed. Thanks to our extensive know-how, at TAG we can offer our clients tailor-made plasma nitriding treatments able to meet all the characteristics needed to ensure the proper functionality of the component during its use on, no matter how complex its geometrical shapes are. Unlike other techniques, plasma nitriding enhances the control over the whole process, thus making it reliable and reproducible. Furthermore, at TAG we use dedicated equipment to load the treated parts and to mask the surfaces. The low temperature the process is performed at optimizes the corrosion resistance of treated components. 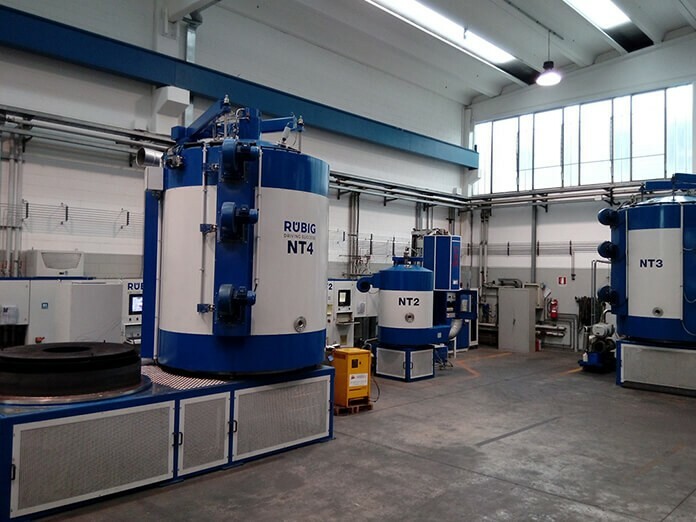 Our state-of-the-art facility located in Dolzago comprises of 4 ion nitriding systems with maximum dimensions of 1500 x 2100 mm and capacity of 7000 Kg. Moreover, the facility is equipped with a 500 x 900 mm system to perform ion nitriding on titanium components for the aeronautical industry.